Rosacea is an autoimmune skin disorder that often leads to eye involvement – ocular rosacea. Ocular rosacea can occur even before the chronic rosacea skin condition on the face begin. The effect of rosacea on eyes in very pronounced and significant. Ocular rosacea is primarily a disorder of meibomian gland dysfunction and blepharitis. Both of these conditions occur due to the lack of a water component in the tear composition. “TheraLife Eye for Ocular Rosacea Dry Eyes” First month supply for first time users. TheraLife Eye is targeted to help you revive and restore your own tears for sustainable lasting relief. This bundle contains 1. Hot Compress to melt clogged meibomian glands, 2. Four bottles of TheraLife Eye capsules. 60 capsules/bottle. 3. One bottle of 100% pure Omega 3 fish Oil, 120 gel caps/bottle. 4. One bottle of eye lid cleanser for lid hygiene. 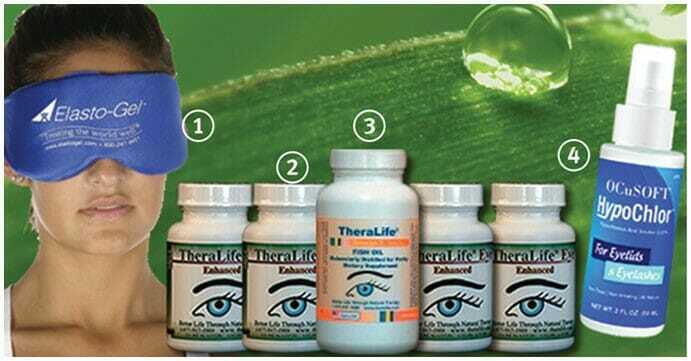 Once stabilized, maintenance dosage of TheraLife Eye capsule is between 1-4/day. Because of the potential severity of ocular rosacea, TheraLife® highly recommends early intervention using TheraLife® Autoimmune plus Omega 3 Fish Oil. This formula contains strong anti-inflammatory agents and ingredients to regulate the immune system. Other anti-inflammatory agents, both biological and pharmaceutical, have sometimes been used by patientsl. Topical ophthalmic steroids are reported to be effective in the prevention of recurrent corneal erosions associated with ocular rosacea when used with oral antibiotics. Severity Level 1. Education and environmental changes, artificial tear substitutes (gels/ ointments) and eye lid therapy. Severity Level 2. If level 1 measures fail, then include: anti-inflammatory, punctal plugs, and moisture chamber spectacles. Severity Level 3. If level 2 measures fail, then include autologous serum drops, contact lenses and permanent punctal occlusion. Severity Level 4. If level 3 measures fail, then include oral anti-inflammatory agents (cyclosporine A, prednisolone, methotrexate and infliximab) and/or surgery eye lid surgery, and cornea transplant. Why Omega 3 Fish Oil for Ocular Rosacea? Omega 3 fatty acids from cold water fish have shown to have anti-inflammatory properties. Nutritional therapy with 1g/day to 2g/day reduces ocular surface inflammation. For vegetarians, flax seed oil can be used instead. Local measures, such as warm compresses and lid scrubs, can be helpful. In ocular rosacea, eyelid scrubbing is used in conjunction with a steroid. TheraLife is the absolute only answer to ocular rosacea / chronic dry eye. TheraLife has eased the discomfort and stinging I experienced on a daily basis from ocular rosacea. The redness use to inhibit me from having a social life. No more waking up wondering how my eyes will look. Now I know they will look refreshed and free of redness. I’ve tried many other ways and paid thousands of dollars for treatments . TheraLife is the only thing that has truly worked. Fujita M, Igarashi T, Kurai T, et al. Correlation between dry eye and rheumatoid arthritis activity. Am J Ophthalmol 2005;140:808-13. Lemp MA. Report of the National Eye Institute/Industry Workshop on clinical trials in dry eyes. CLAO Journal 1995;21:221-31. Ngian GS. Rheumatoid arthritis. Aus Fam Phys 2010;39:626-8. Firestein GS. Kelley’s Textbook of heumatology. 8th ed. Philadelphia: Saunders Elsevier; 2009. Wolfe F, Michaud K. Prevalence, risk, and risk factors for oral and ocular dryness with particular emphasis on rheumatoid arthritis. J Rheum 2008;35:1023-30. Patel SJ, Lundy DC. Ocular manifestations of autoimmune disease. Am Fam Phys 2002;66:991-8. Fuerst DJ, Tanzer DJ, Smith RE. Rheumatoid diseases. Int Ophthalmol Clin 1998;38:47-80. Harper SL, Foster CS. The ocular manifestations of rheumatoid disease. Int Ophthalmol Clin 1998;38:1-19. Samarkos M, Moutsopoulos HM. Recent Advances in the Man agement of Ocular Complications of Sjogren’s Syndrome. Ocular Allergy 2005;5:327-32. Srinivasan S, Slomovic AR. Sjogren Syndrome. Compr Oph thalmol Update 2007;8:205-12. Kassan SS, Moutsopoulos HM. Clinical manifestations and early diagnosis of Sjogren syndrome. Arch Intern Med 2004;164:1275-84. Yannopoulos DI, Roncin S, Lamour A, et al. Conjunctival epi thelial cells from patients with Sjogren’s syndrome inappropriately express major histocompatibility complex molecules, La(SSB) antigen, and heat-shock proteins. J Clin Immunol 1992;12:259-65. Jumblatt JE, Jumblatt MM. Regulation of ocular mucin secre tion by P2Y2 nucleotide receptors in rabbit and human conjunctiva. Exp Eye Res 1998;67:341-6. Ramos-Casals M, Tzioufas AG, Stone JH, et al. Treatment of primary Sjogren syndrome: a systematic review. JAMA 2010;304:452-60. Stone DU, Chodosh J. Ocular rosacea: an update on pathogen esis and therapy. Curr Opin Ophthalmol 2004;15:499-502. National Rosacea Society. 14 million Americans have rosacea and most of them don’t know it. Available at: www.rosacea.org (accessed January 3, 2011). Robak E, Kulczycka L. Rosacea. Postepy Hig Med Dosw 2010;64:439-50. Barton K, Dagoberto CM, Nava A, et al. Inflammatory cytokines in the tears of patients with ocular rosacea. Ophthalmology 1997;104:1868-74. Millikan LE. Rosacea as an inflammatory disorder: a unifying theory? Cutis 2004;73(suppl 1):5-8. Dursun D, Kim MC, Solomon A, et al. Treatment of recalcitrant recurrent corneal erosions with inhibitors of matrix metallopro teinase-9, doxycycline and corticosteroids. Am J Ophthalmol 2001;132:6-13. Bamford JTM, Elliott BA, Haller IV. Tacrolimus effect on rosacea. J Am Acad Dermatol 2004;50:107-108. Lemp, MA. Advances in Understanding and Managing Dry Eye Disease. Am J Ophthalmol 2008;146:350-5. Soo MPK, Chow SK, Tan CT, et al. The spectrum of ocular involvement in patients with systemic lupus erythematosus without ocular symptoms. Lupus 2000;9:511-4. Jabs DA, Miller NR, Newman SA, et al. Optic neuropathy in systemic lupus erythematosus. Arch Ophthalmol 1986;104:564-8. Sivaraj RR, Durrani OM, Denniston AK, et al. Ocular manifestations of systemic lupus erythematosus. Rheumatology 2007;46:1757-62. Tan EM, Cohen AS, Fries JF, et al. The 1982 revised criteria for classification of systemic lupus erythematosus. Arthritis Rheum 1982;25:1271-7. Karpik AG, Schwartz MM, Dickey LE, et al. Ocular immune reactants in patients dying with systemic lupus erythematosus. Clin Immunol Immunopathol 1985;35:295-312. Pflugfelder SC, Solomon A, Stern ME. The diagnosis and management of dry eye: a twenty-five-year review. Cornea 2000;19:644-9. Bron AJ, Sci FM, Tiffany JM. The Contribution of Meibomian Disease to Dry Eye. The Ocular Surface 2004;2:149-64. Apostol S, Filip M, Dragne C, et al. Dry eye syndrome. Etio logical and therapeutic aspects. Oftalmologia 2003;59:28-31. Stern ME, Beuerman RW, Fox RI, et al. The pathology of dry eye: The interaction between the ocular surface and lacrimal glands. Cornea 1998;17:584-9. Lemp, MA, Baudouin C, Baum J, et al. The definition and clas sification of dry eye disease: report of the Definition and Classifica tion Subcommittee of the International Dry Eye Workshop (2007). Ocular Surf 2007;5:75-92. Stern ME, Pflugfelder SC. Inflammation in dry eye. Ocular Surf 2004;2:124-30. Rosenberg ES, Asbell PA. Essential Fatty Acids in the Treat ment of Dry Eye. Ocular Surf 2010;8:18-28. Pinheiro MN, dos Santos PM, dos Santos RC, et al. Oral flaxseed oil (Linum usitatissimum) in the treatment for dry-eye Sjogren’s syndrome patients. Arq Bras Oftalmol 2007;70:649-55. Luchs J. Azithromycin in DuraSite for the treatment of blepharitis. Clin Ophthalmol 2010;4:681-8.